It is often said that the best camera is the one that you have with you. Traditional point-and-shoot cameras are being used less and less, to the point where global shipments were down 53% in the first five months of 2013 and the top three "cameras" on the popular photo sharing site, Flickr, are all iPhones. Recent advances in camera technology have not only increased image quality, but camera use-cases. 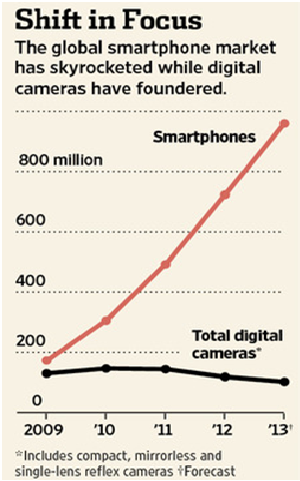 Cameras are becoming "smart" devices that do more than merely take pictures. Now in the digital age, as computing technology advances, so do cameras. Firms are developing new sensors which allow cameras to take better pictures and be used in new and exciting ways. Miniaturization has also allowed cameras to take on new forms. These technological advances, driven by research and development, will help save lives, help people connect, and be used in important industry applications. Advances in cameras have also allowed for better quality control in manufacturing situations. Cameras can analyze products on an assembly line and recognize and identify if there are defective products. These optical recognition systems can be programmed to inspect a product and identify if a label is misprinted, a weld is improper, or if a cereal box does not contain a prize. High-speed cameras are also used by engineers in assembly lines to identify problems. As cameras increase in speed and resolution, assembly lines can work faster and operate at higher efficiency. Costs associated with the implementation of these new sensors are qualifying research and development expenses, and could make the implementation of this new technology more feasible. Shibuya Seiki and National Agricultural & Food Research Organization of Japan have introduced robotics into the farming sector with a strawberry-picking robot. Spanning ten feet long, the device is equipped with 3D stereo cameras and software that determine strawberry ripeness based on color. With 3D camera capabilities and a mechanical arm that snips the berries and collects them in its basket, the robot can pick a ripe strawberry every eight seconds. Because berries are more time consuming to harvest than other produce, this farming innovation saves farmers a great deal of time and labor. Lytro, founded by Ren Ng, a light-field photography researcher at Stanford University, has brought a new type of camera technology to the consumer market. Lytro's camera which is based on Ng's research at Stanford , contains a light field sensor which allows for the focusing of images after they have already been captured. Images can also be converted to a stereo image which creates a three dimensional effect. Light field photography captures the available lights in a scene through an array of micro-lenses. The Lytro cameras are quite large, five inches deep, and the resolution of the pictures are currently low, comparatively, and manufacturers, including Lytro, will look to improve these qualities through continued R&D. Another area of improvement in the future will be the resolution of the images that Lytro and other light field sensors create. The 4k standard is now being implemented and many devices capable of capturing or displaying 4k are entering the market. 4k is defined as content that is ~4,000 pixels wide. Standards such as 4k are put in place and used for a significant time period and many technical studies are often conducted when designing these standards. This standard has ~4x as many pixels as the now dated 1080p standard, which results in a much sharper image. Technology must be developed not only to capture 4k images and video, but to store and display the content as well. 4k cameras produce an immense amount of data which requires new developments in technology to handle the increase. New memory standards, lenses, cooling systems, software and firmware, and other systems to deal with the increased load are being developed by companies such as RED DIGITAL CINEMA. On the display front, 4k capable displays are finding their way to the market. Squito is a throwable camera in the shape and size of a baseball, currently in development. While there have been university efforts to develop this sort of throwable device , Squito has received multiple patents and has been demoing its technology. On its exterior, the unit has a protective shell to secure the electronics within. The unit contains multiple cameras which take panoramic images and gyroscopic-stabilized video while airborne. The Squito device uses software to patch together the images from different perspective and points on the sphere. Through this software, it can also track specific targets. The throwable camera contains thermal imaging and infrared technology, which gives it fire and search and rescue applications. The Squito is the result of a marriage between complex hardware and software. GoPro sells a line of rugged cameras that are meant to be mounted and used to film extreme activity. The company's devices are waterproof up to 60 meters and shock-resistant. They can be head-mounted for sports, operated underwater, and even mounted to an aircraft to capture aerial footage. The company's premiere product, the HERO3: Black Edition shoots video in up to a 4k resolution all while being exposed to the elements. GoPro's devices have built in Wi-Fi capability which allows for Wi-Fi remotes and Wi-Fi interfacing with devices such as smartphones. GoPro has also engineered their device's microphones with wind-noise reduction which allows for better sound recording during extreme situations such as skydiving. Finally, GoPro has engineered countless docks to allow for different applications such as head-mounting, chest-mounting, vehicle-mounting, and surfboard mounting. Overall, GoPro has engineered a rugged camera, with the video and audio technology to capture quality footage in difficult scenarios, while keeping the camera in place and safe from water, shock, and dust. In the mobile industry some companies are doubling down on the megapixel war while others are fighting back against it. In February of 2012, Nokia unveiled the Nokia 808 Pureview which featured an astounding 41 megapixel camera, more than most standalone cameras. The 808 Pureview was succeeded in July 2013 by the Nokia Lumia 1020 which also featured a 41 megapixel camera. The device also has optical image stabilization where the lens of the camera floats to keep images in focus even while the camera is moving (see Figure 2). HTC has fought back against the megapixel war by releasing its HTC One with a 4 megapixel camera. While the megapixel count is low, the number does not tell the whole story. HTC claims that when there are less pixels they can be made larger and therefore capture more light. This results in better pictures, especially in lowlight situations. HTC also uses optical image stabilization in their HTC one camera. The two different approaches taken by Nokia and HTC both continue to push the envelope forward on mobile camera technology. Sony designed a camera product that solves the long-standing trade-off issues between camera phones versus digital cameras. Digital cameras take better photos than cell phones but are sub-par in transferring and transmitting those photos and cell phones are great at transmitting pictures but do not compare in picture quality. The QX100 is a 'half-a-camera', comprised of what looks like just the lens part of a digital camera. Sony's QX100 has a Zeiss glass zoom lens , large sensor, multiple glass components, manual controls, and image stabilization, abilities that cell phones just are not capable of. By attaching this 'half-a-camera' to your smartphone you are able control the camera's functions with your phone screen. The QX100 communicates via Wi-Fi to transfer pictures and videos straight to your smartphone, pairing higher picture quality with easy photo transmission. Electrical engineers from Duke University and University of Arizona have created a camera prototype with a resolution that is five times better than 20/20 vision. By combining 98 microcameras into one device, this technological advancement has the potential to capture 50 gigapixels (50,000 megapixels) of data. While the current prototype is about two square feet, the next step will be to miniaturize the device. Of the gigapixel camera, University of Arizona professor Michael Gehm says, "A shared objective lens gathers light and routes it to the microcameras that surround it, just like a network computer hands out pieces to the individual work stations." The market for mere point and shrink cameras is shrinking. An increasing number of devices have cameras and on the consumer front, companies are adding extra hardware and software features to differentiate. On the commercial front, innovative companies are combining today's camera technology with computing and software technology and introducing devices that can save companies money and time in multiple industries and build consumer loyalty.